Dana Goldberg: Raised by a wild pack of Jews, otherwise known as her mother and siblings, Dana Goldberg is a force of nature on stage. Recently starring in her comedy special “One Night Stand Up; Episode 4” on the LOGO Network, Dana is taking the national scene by storm. Sandra Valls: Fasten your seatbelts! Sandra Valls is a brash, high energy, latina, comic and then some. Voted one of Curve Magazine’s Top 10 funniest lesbian comics she sure packs a punch with her frank, in-your-face comedy performing all over the country as one of the world’s only out Latina comics! 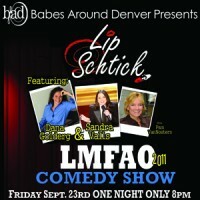 Pam VanNostern:Pam has earned many accolades in her 4 short years in the Denver comedy scene. She is now a feature act at the Denver Improv, where she has also been an in house MC for the last year. She has opened for such notable acts as: Loni Love (Chelsea Lately), Michael McDonald (MADtv), and the one and only Suzanne Westenhoeffer.